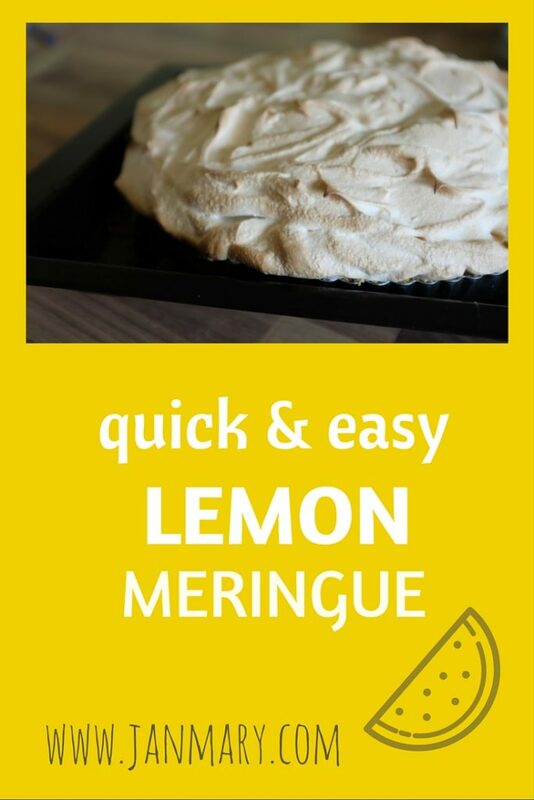 This is such a quick and easy Lemon Meringue recipe, which I had at a friend’s house and she told me it was a Mary Berry recipe. It is really quick, and easy and tastes delicious too! 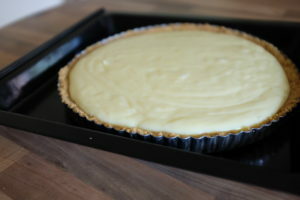 It uses a biscuit base instead of pastry, and the filling comes together really easily – promise! 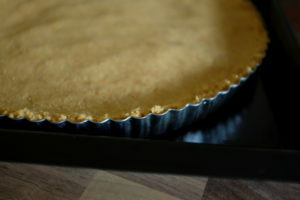 I use a loose bottomed flat tin. 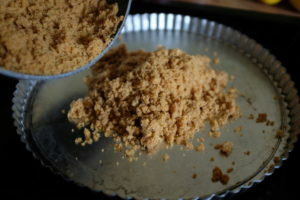 Melt the butter in a saucepan, then add the sugar and biscuit crumbs, mix together well and press into tin. 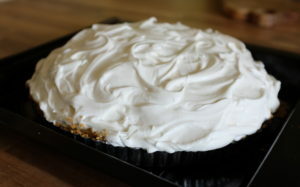 I pressed it in with a spoon and kept the edges raised slightly to contain the filling. 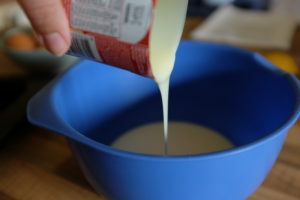 To the make the filling I pour the condensed milk into a large bowl (and it is impossible not to get sticky at this point! 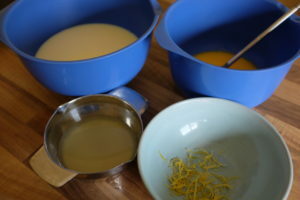 ), then added in the egg yolks, lemon rind and the strained lemon juice. Stir until the mixture thickens. 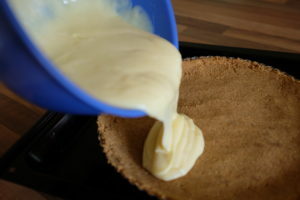 I pour the mixture onto the biscuit base, keeping it from going over the edge. 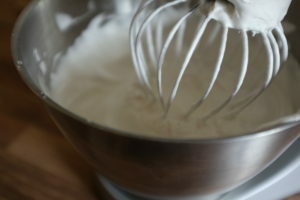 Next I make the meringue – make sure the mixing bowl is spotless before the adding the egg white. 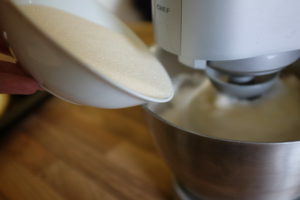 I use my mum’s Kenwood mixer, Mum being a much better baker than me, but it is nice to use it – the sound of it still reminds me of her baking – and getting to lick the beaters and bowl of course! Beat the egg whites until stiff, but don’t over beat them. 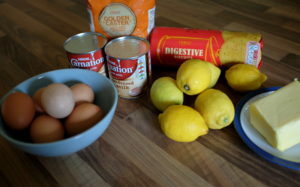 Gradually add the caster sugar, beating all the while. 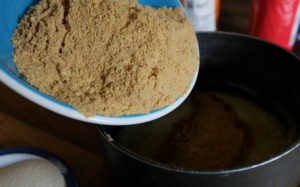 When the mixture is ready it will leave a thick trail. 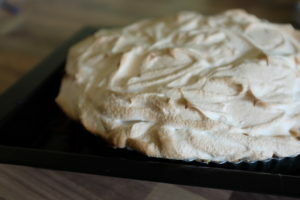 You are now ready to spread the meringue over the filling and base – try to seal in the filling to prevent it from leaking in the oven. It just takes 15-20 minutes in the oven to become golden brown. Allow to cool for 30 minutes before serving warm, although also delicious cold. Like the look of this recipe? Why not pin it! If you try the recipe let me know how you get on.